The city has a rich history; an amalgamation of diverse cultures which is unique and reflected in it’s language and architecture. Today the city is a major hub for information technology and thus also known as Cyberabad. Rajiv Gandhi Hyderabad International Airport designed by Honk Kong based architects Winston Shu and Gumund Stokke has a swooping roof with plenty of glass frontage reflecting India’s growth and establishes itself as a gateway to a modern city. The arrivals hall seemed spacious with high ceilings but lacked character and was deserted in the morning. The cab ride from the airport to Banjara Hills took less than 20 minutes. Banjara Hills is an affluent neighborhood. It is an urban commercial district that also houses swanky homes. Members from the tollywood film (telegu film industry) industry, politicians and business men live here as well. As the cab began winding up and down the hills I realized that most of the houses were traditional in style and two to three stories tall spelling opulence and grandeur. Then the cab passed a house which reflected an international style and spoke a universal language. I was intrigued and so kept staring back – the house had screens that were both movable and immovable. The house reminded me of Bijoy Jain’s Palmyra House, and Foreign Office Architects The Carabanchel Housing in Madrid, Spain. Then I noticed my friend standing in one of the balconies. I was overwhelmed to learn that the house belonged to my friend’s family. 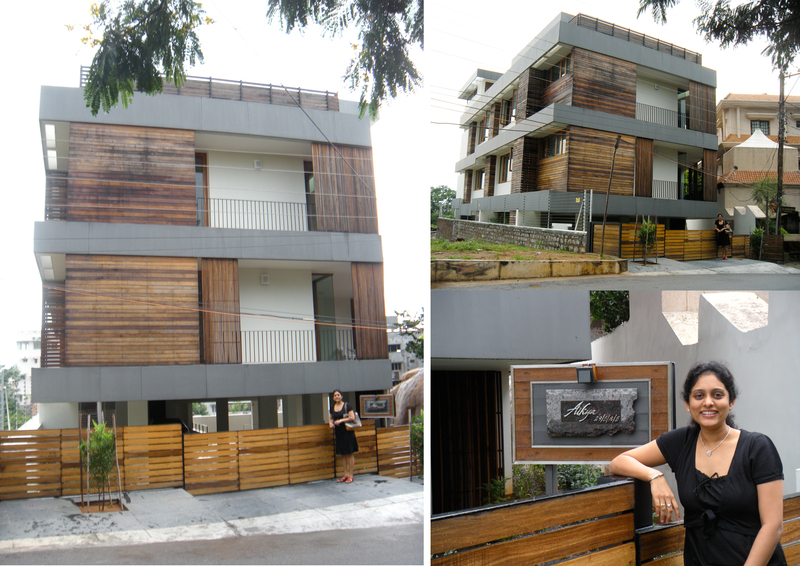 They recently moved in and the house has been designed by architect Kiron Cheerla. Cheerla is a University of Texas alum, he worked in Dallas briefly and returned to India about 10 years ago and now has his own practice in Hyderabad. The brief given to Cheerla for the house was that there should be plenty of natural light and cross ventilation. Each space is well-connected to the exterior with balconies and well framed views. 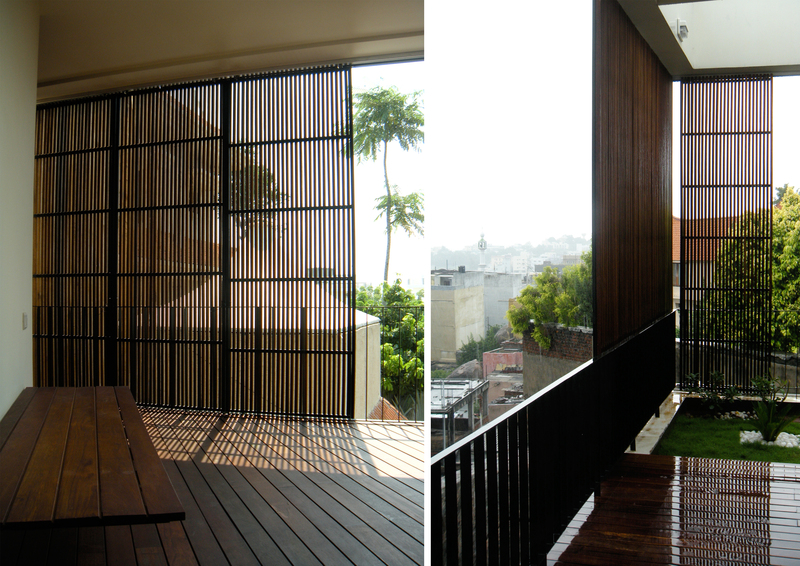 The use of movable screens on the facade help control the amount of light that is permitted into spaces. The penthouse level has a good-sized terrace from where the historic Golconda Fort can be viewed. The house is minimalist in nature, with straight lines and angles connecting spaces – reflecting the transformation of culture and the acceptance of an international style. Once inside the house, before I could put down my bag I insisted that my friend give me a tour of the house. Besides a few light fixture selections and some details I felt the spaces flowed well and materials transitioned naturally. Later that day I dropped by Cheerla’s office and had a brief conversation about his work. After the tour I was treated to some masala dosas(spiced crepe) for breakfast and then later that afternoon to some homemade kheema (minced lamb) biryani. I could not have asked for a better start to the weekend. More on Hyderabad and the trip to follow soon. This entry was posted in Art, Culture, Design, Food, Travel and tagged Architect, Architecture, art, Culture, Design, Food, Hyderabad, Indian, Traditions, Travel. Bookmark the permalink.